Joule heating (also referred to as resistive or ohmic heating) describes the process where the energy of an electric current is converted into heat as it flows through a resistance. In particular, when the electric current flows through a solid or liquid with finite conductivity, electric energy is converted to heat through resistive losses in the material. The heat is generated on the microscale when the conduction electrons transfer energy to the conductor's atoms by way of collisions. Heating circuit: Temperature distribution as a result of Joule heating. Heating circuit: Temperature distribution as a result of Joule heating. In some cases, Joule heating is pertinent to an electrical device's design, while in others, it is an unwanted effect. A couple of applications that do rely on Joule heating include hot plates (directly) and microvalves for fluid control (indirectly, through thermal expansion). In the event that the effect is undesirable in a design, efforts can be made to reduce it. It is particularly relevant in terms of electrical systems components, such as conductors in electronics, electric heaters, power lines, and fuses. The heating of these structures can cause them to degenerate or even melt. 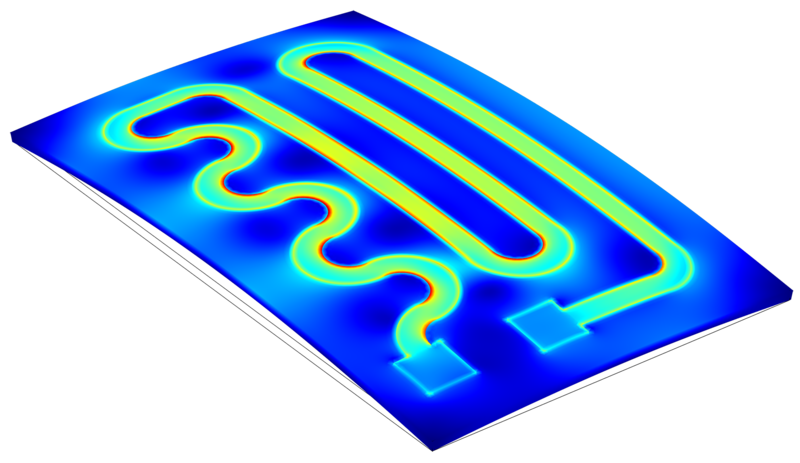 To prevent the components and devices from overheating, engineers can incorporate convection cooling into the design. Below is an example of mechanical stress induced in a heating circuit by way of Joule heating. Upon applying a voltage to the circuit, the electrically conductive layer over the glass plate causes Joule heating. This, in turn, impacts the structural integrity of the circuit and induces bending of the glass plate. Heating circuit: The stress is highest in the red areas. The glass plate in the circuit bends due to the heat imposed on the plate and the expansion of the circuit. 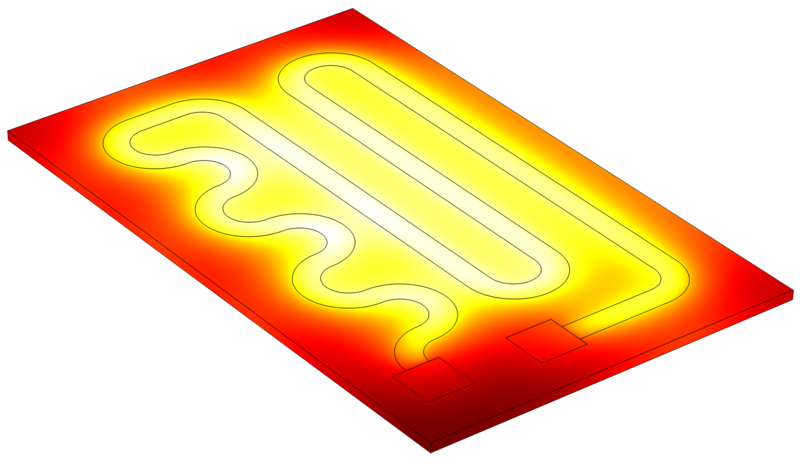 Heating circuit: The stress is highest in the red areas. The glass plate in the circuit bends due to the heat imposed on the plate and the expansion of the circuit.